Before any plutonium could be chemically separated from uranium for a bomb, however, that uranium would first have to be irradiated in a production pile. CP-1 had been a success as a scientific experiment, but the pile was built on such a small scale that recovering any significant amounts of plutonium from it was impractical. In the fall of 1942, scientists of the Met Lab had decided to build a second Fermi pile at Argonne as soon as his experiments on the first were completed and to proceed with the "Mae West" design for a helium-cooled production pile as well. When DuPont engineers assessed the Met Lab's plans in the late fall, they agreed that helium should be given first priority. They placed heavy water second and urged an all-out effort to produce more of this highly effective moderator. Bismuth and water were ranked third and fourth in DuPont's analysis. Priorities began to change when Enrico Fermi's CP-1 calculations demonstrated a higher value for the neutron reproduction factor k (for a theoretical reactor of infinite size) than anyone had anticipated. Met Lab scientists concluded that a water-cooled pile was now feasible. Crawford Greenewalt, head of the DuPont effort, continued, however, to support helium cooling. The higher value for k also seemed to make possible an experimental pile using air cooling. 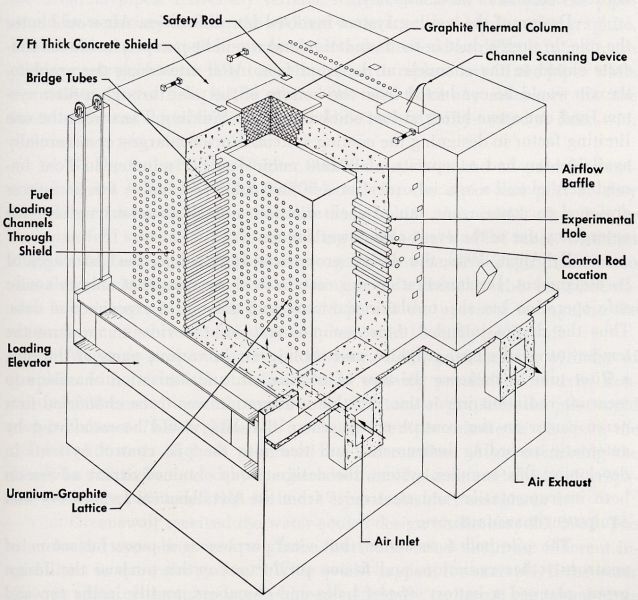 Since a helium-cooled unit shared important design characteristics with an air-cooled one, and an air-cooled unit would be easier to design and quicker to build, Greenewalt thought that first constructing an experimental air-cooled production pile at Oak Ridge would help significantly in designing the full-scale helium-cooled reactors for Hanford. 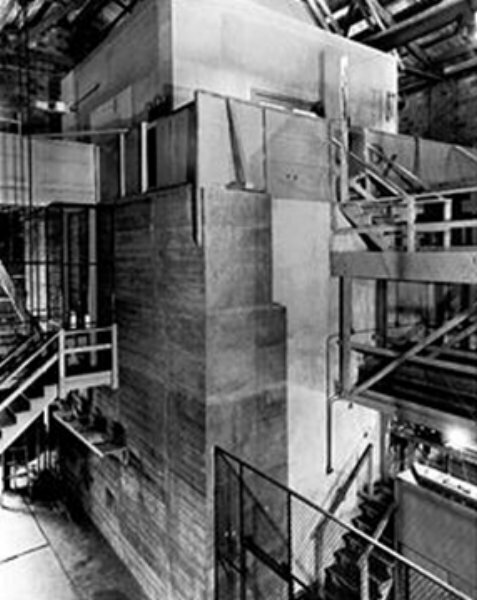 Thus, the X-10 Graphite Reactor (right) was born. In early 1943, DuPont established the general specifications for this experimental production reactor at Oak Ridge, as well as its accompanying chemical separation facilities. X-10 would be a massive graphite block, protected by several feet of concrete, containing hundreds of horizontal channels filled with uranium slugs surrounded by cooling air. New slugs would be pushed into the channels on the face of the pile, forcing irradiated ones at the rear to fall into an underwater bucket. 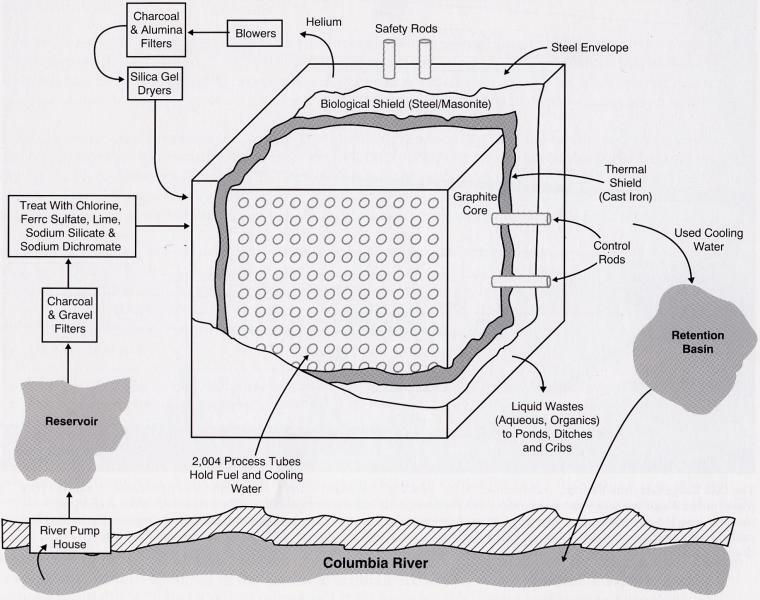 The buckets of irradiated slugs would undergo radioactive decay for several weeks, then be moved by underground canal into the chemical separation facility where the plutonium would be extracted with remote control equipment. DuPont broke ground at the X-10 complex at Oak Ridge in February 1943, and on November 4, 1943, X-10 went critical for the first time. By the end of the month, it was producing small but experimentally-valuable samples of plutonium. Met Lab activities focused, meanwhile, on the design of the proposed full-scale water-cooled piles to be built at Hanford (right). Taking their cue from the DuPont engineers, who utilized a horizontal design for the air-cooled X-10, Met Lab scientists abandoned the vertical arrangement with water tanks, which had posed serious engineering difficulties. Instead, they proposed to place uranium slugs sealed in aluminum cans inside aluminum tubes. The tubes, laid horizontally through a graphite block, would cool the pile with water injected into each tube. The pile, containing 200 tons of uranium and 1,200 tons of graphite, would need 75,000 gallons of water per minute for cooling. Greenewalt's initial response to the water-cooled design for Hanford was guarded. He worried about pressure problems that might lead to boiling water in individual tubes, corrosion of slugs and tubes, and the one-percent margin of safety for k. But he was even more worried about the proposed helium-cooled model. He feared that the compressors would not be ready in time, that the shell could not be made vacuum-tight, and that the pile would be extremely difficult to operate. DuPont engineers conceded that Greenewalt's fears were well-grounded. Late in February, Greenewalt reluctantly concluded that the Met Lab's model, while it had its problems, was superior to DuPont's own helium-cooled design and decided to adopt the water-cooled approach. The Met Lab's victory in the pile design competition came as its status within the Manhattan Project was changing. Still an exciting place intellectually, the Met Lab occupied a less central place in the bomb project as Oak Ridge and Hanford rose to prominence. Fermi continued to work on the Stagg Field pile (CP-1), hoping to determine the exact value of k. Subsequent experiments at the Argonne site using CP-2 (right), built with material from CP-1, focused on neutron capture probabilities, control systems, and instrument reliability. Once the X-10 production reaction projects were underway, however, Met Lab research became increasingly unimportant in the race for the bomb and the scientists found themselves serving primarily as consultants for DuPont's work at Oak Ridge and Hanford. Click here to view sources and notes for this page.